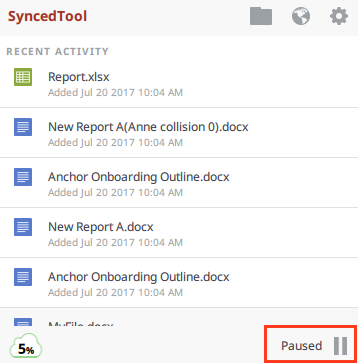 End users have the option of pausing a sync process from the desktop client. 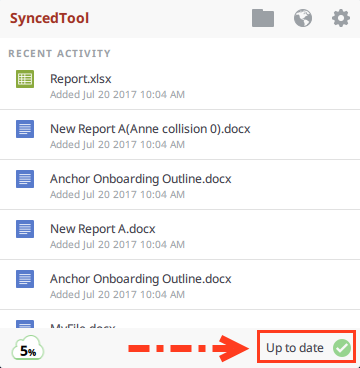 This feature is useful when users want to conserve bandwidth, when they are working without an Internet connection, or when they want to work in isolation. Additionally, the desktop client will automatically pause a sync process when disk space is detected to be below 1GB. Click the system tray icon and hover over the Status message (for example, Up to date). When the text changes, click the Pause button. To resume the sync process, hover over Paused and select Resume.